Differentiation from competitors by giving the customer a competitive advantage through the pursuit of excellence at all levels of the organization. As guests can see for themselves when visiting the plant, Clients benefit from the Machiper S-Plus programme thanks to the company's ability to organize work and to employ technological instruments and techniques to facilitate and speed up production. 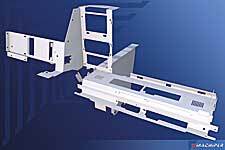 This ability makes all the difference in the highly competitive field of sheet metal manufacturing. Machiper has in fact been chosen as a crucial partner by world-leading companies in several fields and in recent years it has succeeded in expanding in Europe, in confirming agreements with existing Clients and in increasing its turnover starting a positive and steady period of growth, despite the peak of the economic crisis and unfavourable market conditions.